The Collected Interior: Chalkboard Menu! Have I got a fun week-end project for you! 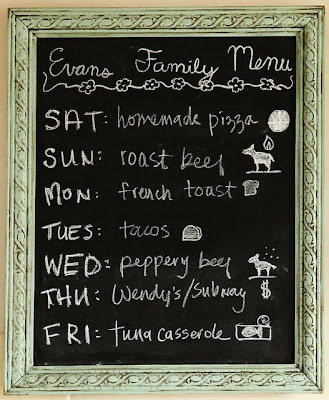 Make a Chalkboard Menu in just a couple of hours...so easy, cute and functional too! Start with any ole' frame from your attic, or find one at your favorite Thrift Store. Paint it with your favorite color, and then add some glaze after that. Finally paint a piece of MDF with chalkboard paint and voila! 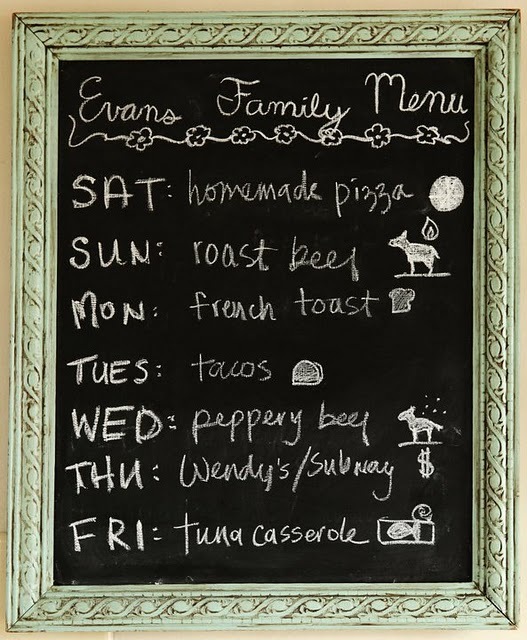 A Chalkboard Menu...so your favorite peeps can see what Mamma's got cooking every night! I LOVE this. ﻿Need more info...find this fabulous project at Take The Side Street! Thanks so much for featuring my project! :) I was excited when I saw it pop up in my reader. Hope you had a great weekend! I love chalkboard frames. I just posted one I did on my blog. This is so cute. I will have to make one of these. I love glaze and chalkboards! Have you tried Chalkink? Check out my chalk board project! I would love if you stopped by and becoming a follower! I love being your follower! I AM working on one! I found a frame that was 3x5 FEET!!! Yes, FEET! I'm looking at making it magnetic and am trying to find someone that carries sheet metal that big! Sounds awesome Miss Obara...let me know when you finish it!